The volume of retail sales increased by 2.6% in the month of November, with an annual increase of 6.8%. 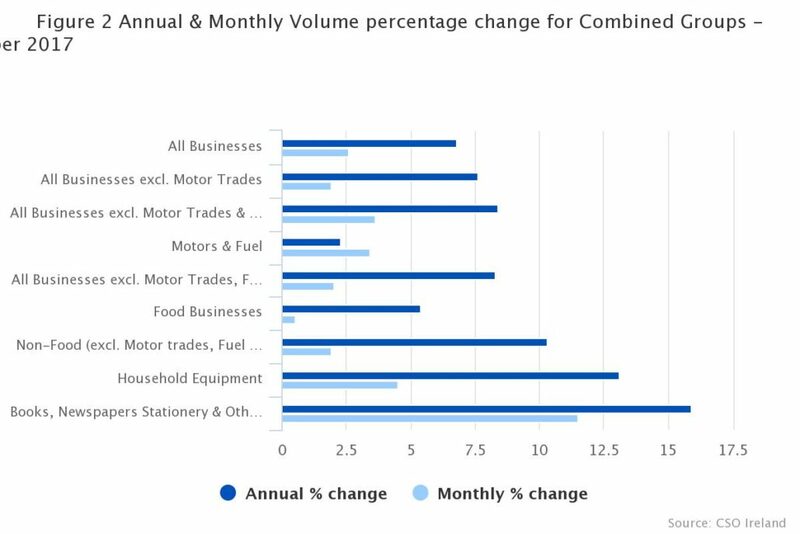 If Motor Trades are excluded, there was an increase of 1.9% in the volume of retail sales in November 2017 when compared with October 2017 and there was an increase of 7.6% in the annual figure. The sectors with the largest monthly volume increases were Electrical Goods (14.5%), Department Stores (6.7%) and Other Retail Sales (5.7%). The sectors with the largest month on month volume decreases were Pharmaceuticals Medical & Cosmetic Articles (-11.2%), Bars (-1.5%) and Books, Newspapers and Stationery (-1.2%). There was an increase of 2.6% in the value of retail sales in November 2017 when compared with October 2017 and there was an annual increase of 4.4% when compared with November 2016. If Motor Trades are excluded there was an increase of 1.2% on the month and an increase of 4.5% in the annual figure.